A Bardstown resident, Mrs. Theresa Ann Ferguson, age 76, passed away Tuesday, December 4, 2018 in Baptist Health in Louisville. She was born December 31, 1941 in Nelson County to the late John Clever and Bessie Ritchie Hardy. 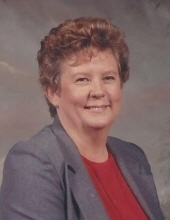 Theresa was a homemaker, caring babysitter, amazing horticulturalist and a member of The First Cedar Creek Baptist Church where she served in the nursery, youth group, on the bereavement committee and church league softball and basketball. She was an avid NCAA fan and loved to watch her grandchildren and great grandchildren play sports. She was a devoted wife, loving mother, nurturing grandmother, great grandmother, and a phenomenal cook. Theresa had a kind soul with a sweet disposition and always put others before herself. Along with her parents, she was preceded in death by a daughter, Donna Jo Ferguson. She is survived by her husband of 59 years, Donald Whyne Ferguson, 4 daughters, Debra Sue Bodine, of Bardstown, Darlene (Charlie) Ball of Boston, Dell (Terry) Vittitow, Dawn (Kent) Culver, both of Bardstown, her son, Daniel Anthony (Carol) Ferguson of New Haven, a sister, Mary (Jimmy) McCubbins of Bardstown, 12 grandchildren and 11 great grandchildren. She leaves behind extended family and friends who adored her. Cremation was chosen by the family. A public memorial service will be 1:00 pm Saturday, December 8, 2018 at The First Cedar Creek Baptist Church. A private burial will follow for immediate family only. The family requests that expressions of sympathy take the form of contributions to The First Cedar Creek Baptist Church Bereavement Committee. The Houghlin-Greenwell Funeral Home is in charge of arrangements. To send flowers or a remembrance gift to the family of Theresa Ann Ferguson, please visit our Tribute Store. "Email Address" would like to share the life celebration of Theresa Ann Ferguson. Click on the "link" to go to share a favorite memory or leave a condolence message for the family.